Florida Senator Alan Hays is about to propose a bill that would require all schools in his state to show conservative filmmaker Dinesh D’Souza’s movie – America. However, the film will not be mandatory for students whose parents don’t want them watching it. The plan is sure to draw fire from liberals not only because D’Souza is a prominent conservative but because he is also behind the movie, 2016: Obama’s America, which is a profoundly negative take on Democratic U.S. president Barack Obama. Hays said the purpose of his proposal is to introduce more balance into Florida schools. D’Souza’s film America focuses on teaching the history of the United States from a patriotic perspective. In addition, the film highlights America as one of the greatest ideas throughout the history of civilization. Whether Hays’s bill ends up passing is up for debate. But in a public education system run nearly exclusively by the Democrat Party, it would be refreshing to know students were being taught a different point of view. It appears Senator Hays just wants to even the playing the field by mandating America to be shown in schools. I’m happy to report a Utopia had a wildly successful opening weekend in Denver – we took in $ 31,710, making it the number one per screen average grossing film in the USA for the weekend! The enthusiasm in the audiences was incredible, a standing ovation at every screening! Group even came back again with American flags! Due to this success, we are now expanding in the Denver area, in addition to the Colorado Center, we are adding the following venues as of August 1st. PLEASE email, Facebook, and spread the word! This was the theme at the 2014 Western Conservative Summit, held in Denver on July 18 thru July 20th and sponsored by the Centennial Institute, the Colorado Christian University’s Think Tank. The Reagan Club of Colorado was there . . . and one of the consistently recurring ideas was the values, ideals and leadership of Ronald W. Reagan. Our 40th President passed away 10 years ago; and has been out of office for 28 years . . . why the perennial memories and enduring admiration for President Reagan? The Western Conservative Summit featured Reagan in publicizing the event . . . showing President Reagan from his 1964 speech, “A Time for Choosing”. . .
Where, then, is the road to peace? Well it’s a simple answer after all. You and I have the courage to say to our enemies, there is a price we will not pay. There is a point beyond which they must not advance. There’s something going on in time and space, and beyond time and space, which, whether we like it or not, spells duty. You and I have a rendezvous with destiny. The importance of the individual to the history and success of our great land is undeniable – in spite of the rhetoric of the progressives and anti-American Tradition types. The Reagan Club of Colorado is a group of and from the “grassroots” – and is committed to supporting the informing, involving and strengthening the individual and the families and communities in which they live and love. To that aim – The Reagan Club of Colorado is throwing a BBQ that will focus on what makes America Her Best . . . faith, family and friends . . . for conservative voters of Adams County and the surrounding area. Hamburgers and Hot Dogs. This includes toppings and side dishes that will delight the taste buds – while you share an enjoyable evening with other conservatives. We are offering a substantial discount for tickets – if you pay online (http://www.reaganclubco.com/august-7th-meeting-tickets/) before August 5th at midnight. The regular prices are $20.00 for Members and $25.00 for Non-Members . . . BUT – prepay online and the deal is . . .
$15.00 for Members – who can bring a guest for $5.00 . . . that’s $20.00 for two. $20.00 for Non-Members – who also can bring a guest for just $5.00. We’ll see you Thursday night, August 7th! After initially supporting incumbent Sen. Mark Udall (D., Colo.), through the first quarter of this year, oil and natural gas companies have since overwhelmingly supported his challenger, Rep. Cory Gardner (R., Colo.), over Mr. Udall. Mr. Udall was among this election cycle’s top recipients of oil and gas money through March, having received $201,550 from the sector, according to Federal Election Commission data compiled by the Center for Responsive Politics up to March. 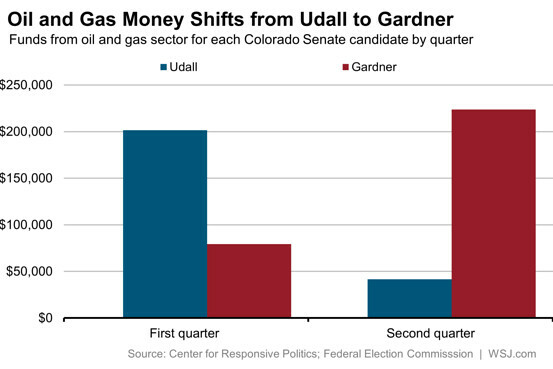 At that time, Mr. Gardner, who announced at the end of February his intent to challenge Mr. Udall after getting three other GOP candidates to bow out of a potentially bruising Republican primary, had received just $79,300 from the oil and gas industry for his House re-election bid. Some of the biggest names in the conservative movement — including former Alaska Gov. Sarah Palin, Sen. Ted Cruz (R-TX), and Dr. Ben Carson — will speak in Denver this weekend for the Western Conservative Summit. The annual event comes as President Barack Obama’s popularity is cratering and the scandals attached to his administration are only getting worse. Breitbart News will livestream the three-day conference, which also feature our own Ben Shapiro, Louisiana Gov. Bobby Jindal and Sen. Mike Lee (R-UT).